Capacity 12,000 lbs. maximum vertical load 60,000 lbs. M.G.T.W. 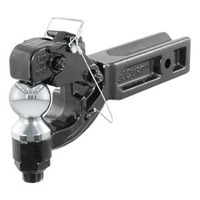 Description Swivel action provides torsional relief at the coupling. 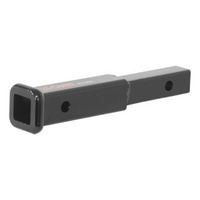 Drawbar Eye Dimensions 3" I.D. with 1-5/8" diameter section. Forged alloy steel. Includes mounting hardware and capacity decal. Fits trailer hitches with a 2 1/2" x 2 1/2" receiver tube opening. Constructed from solid, forged steel for superior strength. Equipped with a 1 1/4" hole to accept a trailer ball shank. 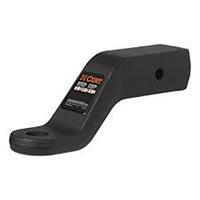 2 1/2" rise or 4" drop for precise trailer leveling. Protected by a highly durable carbide powder coat finish. 2-5/16 INCH COMBO STRAIGHT PINTLE HOOK 20K 2.5 INCH - - Fits trailer hitches with a 2 1/2" x 2 1/2" receiver tube opening. Couples to 2 5/16" couplers or lunette eyes with a 2 1/2" or 3" inside diameter. 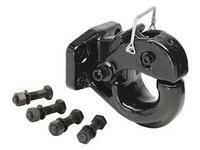 Spring-loaded locking arm for secure coupling. Constructed from solid, forged steel for superior strength. Protected by a durable powder coat finish. Changeable trailer ball features a hard chrome finish. 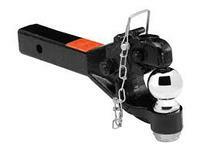 Includes 2 5/16" pintle ball and safety pin with chain.